Dunno what you guys are all doing, but here are some cool ideas! Esp. the last one if you are near good fireworks!! Thought I'd show you a lil somethin somethin ;) No more pink rexy! Today I have made great progress! As it is, you can spectate or join the game. If you join the game as a human, you actually are a pink t-rex. 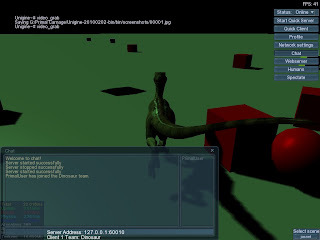 If you join as a dino, you are a normal looking raptor. So I am now in the process of melding into netPlayer a first person view capability so that the human can actually be a ..err.. human. Then I am going to hook up the controls and movement for the players so that that is shared through the network as well as everything else. As it is it's only local, as I ripped out the code when I was having some issues from before. 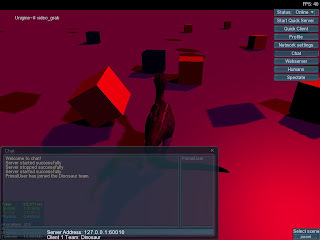 I am going to build it better this time, but it's already rather fun as when you spawn as a dinosaur, the camera is behind you, so actually feel like you are running around in a real game! Okay, well, I've got the webserver now displaying a chat history box so that the website can perform full two way communication with the players in the game. I want to add CSS to the webserver so that it can look a lot better and more organized/user-friendly. Getting the ball rolling here is entirely reliant on a simple line or two, and as I've already given internal tags css ids, I kind of want to do that. 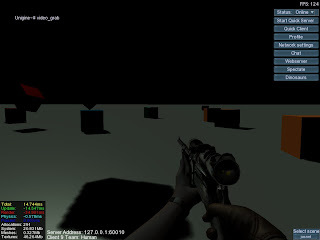 But I also have work to do cleaning up the entity transmission code: animations need to sync over the network too. I've fixed every glitch I've been having, but in the process of re-writing the code the 2nd time the players no longer transmit their positions, only the server transmits its! Kind of an important step hah. So that is also on my immediate to do list. Well, unfortunately I won't be doing much more work on at least one of my recent songs as after a little bit of work it seems to jig Live into only my right audio channel and if I barely touch the set Live just crashes and I have to wait a while so I can restart it. Soo, I am typing this. Networking is coming along great! I do wish it was coming along faster, but who doesn't. As well, it actually has come quite fast, because I got it all working manually already! But, I trashed that after getting an awesome response from the Unigine crew shedding a little more light on their networking system. I am an artist and a computer programmer, and a musician.